The French Ensemble Les Musicians de Saint-Julien gives us a new and wonderful program of Gaelic songs and dances of the 17th and 18th centuries. 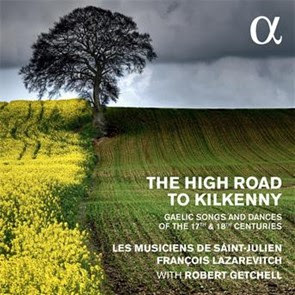 NOTE: All of the music on this program came from the recording The High Road to Kilkenny featuring Les Musicians de Saint-Julien directed by François Lazarevich. It is on the Alpha label and is CD No. 234. After the success of For ever Fortune, early music from Scotland, François Lazarevitch continues his exploration of the Celtic repertories with a new programme devoted to early Irish music. This repertory of old airs from the seventeenth and eighteenth centuries consists of dances, songs in Gaelic and varied instrumental pieces: they tell tales of wars, of love, of strong drink and tobacco, of children and bards. A leading specialist in the flute and bagpipe families, François Lazarevitch opens out new horizons of colours and sounds. He has gathered around him here a number of distinguished performers of early music (including the fabulous Baroque violinist and fiddler David Greenberg) and invited the American tenor Robert Getchell, who cuts a very credible figure as a singer going back to his roots.